We are entitled to offer our range in accordance with industrial standards. Quality assurance is our first priority which is dually taken care of by stringent quality control management. 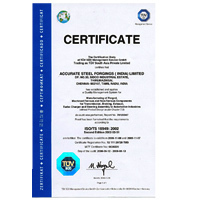 Our organization has been certified by TUV for constantly maintaining its TS 16949:2002 Quality Management Systems. Moreover, we can easily customize our range in accordance with IS, AISI, EN, DIN, JIS & ETC standards. We also have been awarded “Star performer” award by engineering export promotion council- southern region for good contribution to engineering exports in ferrous forgings for year 2005-06 and 2006-07. Our quality analyst keep a strict vigil on the production procedure in order to ascertain that our products stand high on the quality parameters. Raw material is sourced from reliable vendors and is duly checked to ensure they are at par with international standards. Owing to these quality checks, our product range has become one of the coveted goods amidst our clients based all over the India. Our penchant to ensure timely delivery of the products in the lead time span provides us an extra edge over the other players in similar business.